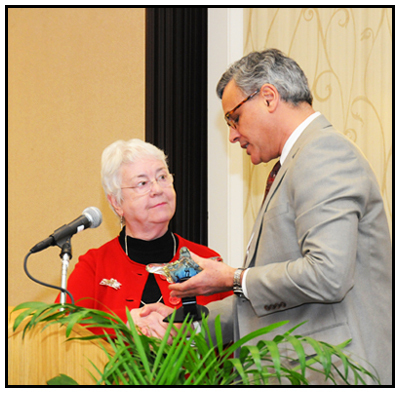 Dr. Rachael Stevens was honored as the 2011 recipient of the Ronald Levine Legacy Award in recognition of her lifetime of contributions to public health in North Carolina. Named for former North Carolina State Health Director Dr. Ron Levine, the annual award honors individuals whose work and commitment on behalf of the public’s health has resulted in significant, sustainable and positive improvements to health and quality of life in North Carolina. Stevens is a senior advisor for the N.C. Institute for Public Health and a consultant to the U.S. Centers for Disease Control and Prevention (CDC). She began her career as a nurse in health departments in Chapel Hill and Cabarrus County and was a Public Health Nursing Education and Research Specialist in the N.C. Division of Health Services (now the Division of Public Health). Among her many public health activities, Stevens has been a leader in the Association of North Carolina Boards of Health and is a member of the Chatham County Board of Health. On the national level, she has been active in the National Association of Local Boards of Health and has participated in leadership of the Robert Wood Johnson Foundation and CDC-funded Multi-State Learning Collaborative since 2005. A graduate of the UNC-Chapel Hill School of Nursing, Stevens has been a clinical assistant professor in public health nursing at the UNC-Chapel Hill School of Public Health, providing scholarly advising to many graduate students, many of whom work in public health in North Carolina.